Evelyn was born on May 6, 1929, the daughter of Homer & Lenore (Robinson) Posorske. On May 27, 1950, she married Merlin Haase and she lived the next 69 years on the family’s Century farm in Borth. 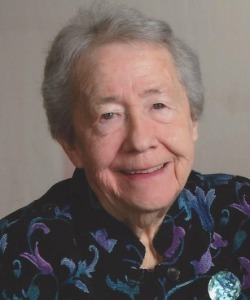 Evelyn dedicated her life to homemaking and the nurturing of her family. Her other interests included watching the Brewers, gardening, bird watching, baking, Girls Weekends, camping with her family, and trips to the cabin. Survivors include daughters, Ruth Haase, of Delavan; Judy (Will) Kasuboski, Brenda (Jeff) Baxter, both of Berlin; daughter-in-law, Sue Haase, of Borth; grandchildren, Kevin (Heather) Haase, Ryan Haase, Chris Haase, Laura (Dan) Brellenthin, Andy (Sarah) Kasuboski, Claire (Josh) Wendt, Jeremy (Jamie) Baxter, and Jason Baxter; great-grandchildren, Lilly and Kolby Haase; Charlie and Hattie Kasuboski; Katie, Amber, Riley, and Ben Brellenthin; Ebbie Baxter; sister Donna Moldenhauer; sisters-in-law, Donna Albright, of Berlin; Luella Remmel, Ina Mae (Gaylord) Remmel, all of Oshkosh. Evelyn was preceded in death by Merlin in 2006; and her sons, John in 1987, and Jim in 2005; her parents; sisters, Ellen and Gwen; brothers, Howard, Burt and Dale. A visitation for family and friends will be on Thursday, April 11, 2019, from 4:00 to 7:00 p.m. at Mueller Funeral Home 904 E. Main St. Winneconne. Visitation will continue on Friday, April 12 from 10:00 to 11:00 a.m. at the Borth United Methodist Church W304 Cty Rd D Berlin. A funeral service will be held on Friday at 11:00 a.m. at the church with Pastor Becky Kindschi officiating. Burial will follow in the Borth Cemetery. In lieu of flowers, memorials will be established at the Borth United Methodist Church and Borth Cemetery. If you wish please submit online condolences to muellerfh.net. Ruth and Family, I am so sorry for your loss and will keep you in my thoughts and prayers. We screen all comments out of consideration for the families and friends of the departed.